In large mixing bowl whisk together flour, cinnamon, baking powder, baking soda, yeast, and brown sugar. Add eggs, butter, applesauce, and buttermilk. Mix on high just until smooth. Don’t over mix. Let batter rest for about 15- 20 minutes. Then fold in pecans. Preheat oven to 325*F. Using a ¼ cup ice cream scoop fill each muffin cup with batter. If you don’t use the muffin papers then you must grease and flour your muffin pan. 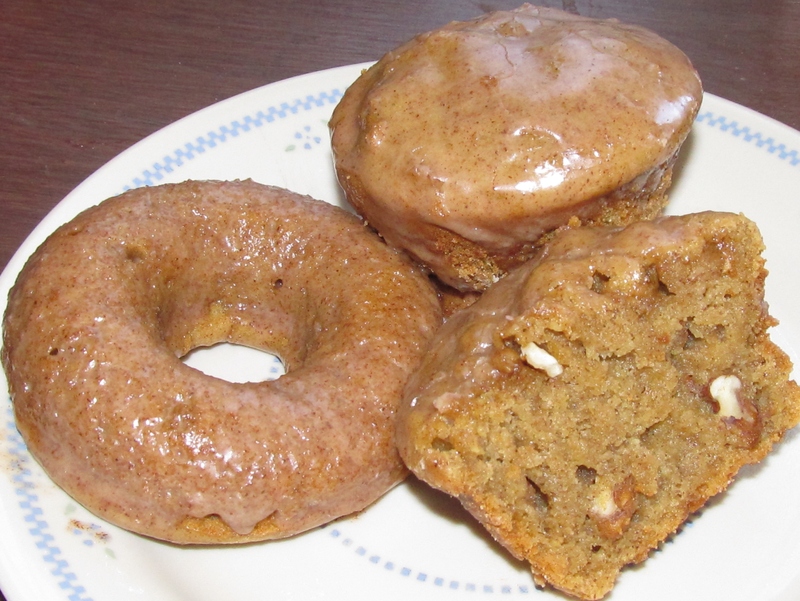 If you are making doughnuts, grease a non-stick doughnut pan and fill each doughnut place with batter almost to the top. Bake muffins for 28- 30 minutes and doughnuts for 25 minutes. This recipe will make a dozen small cupcake size muffins and 6 doughnuts. Whisk until smooth and dip or brush muffins and doughnuts with glaze. Enjoy for breakfast or treat!